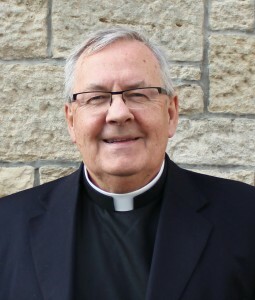 Fr Magill was ordained priest in 1976, having been a student at the Pontifical Scots’ College, Rome, and been awarded Bachelor degrees in Philosophy and Theology from the Pontifical Gregorian University. In 1978 he was awarded a Licenciate (Masters) Degree in Sacred Scripture from the Pontifical Biblical Institute in Rome. After serving for a year in the Cathedral parish, Motherwell, he returned to Rome as Vice-Rector of the Scots’ College. During those years, he was also an associate professor of the Gregorian University and a lecturer in the Beda College. When he returned to Scotland, Fr Magill became lecturer in Sacred Scripture at Chesters College in Bearsden, at that time our seminary in Scotland. During those years, he worked closely with colleagues in the Faculty of Divinity of Glasgow University where he later became a part-time lecturer in the Bible and which awarded him a Doctorate of Philosophy for his dissertation on the Gospel of Mark. Over the years, Fr Magill assisted in various parishes in Motherwell Diocese: St. Bride’s East Kilbride, St. Mary’s Coatbridge, St. Mary’s Hamilton, St. Columbkille’s, Rutherglen. Latterly, he was parish priest of St. Dominic’s, Craigend and Garthamlock. At he beginning of September 2015, he was delighted to take up his new ministry as Parish Priest of St Athanasius’, Carluke. At the diocesan level, Fr Magill has been elected by his colleagues as Chairman of the Council of Priests. The Bishop has also appointed him as Vicar Episcopal for Mission and Evangelisation in the Diocese.